Chief Engineer (Trans) : 03 posts, Salary Scale : Rs. 45900-88800, Eligible Age : 50 years. 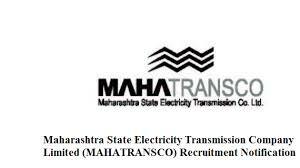 Candidates has to pay Rs.700/- through Demand Draft (Having CTS Code) payable to the “Maharashtra State Electricity Transmission Company Ltd.,” drawn on any Nationalized Bank payable at Mumbai. Candidate are advice to write their Full Name & Post Applied on the backside of Demand Draft(Rs.350/- is to be charged by ST/SC Candidates). Candidates has to fill the application as prescribed format and write on envelope “Application for the post of Chief Engineer (Trans) – Advt. No. 07/2016” and sent to The Chief General Manager (HR), Maharashtra State Electricity Transmission Company Ltd, Prakashganga, E-Block, Plot No, C-19, 7th floor, HR Department, Bandra-Kurla Complex, Bandra (E), Mumbai - 400051 before expiry daten i.e. 20/09/2016.